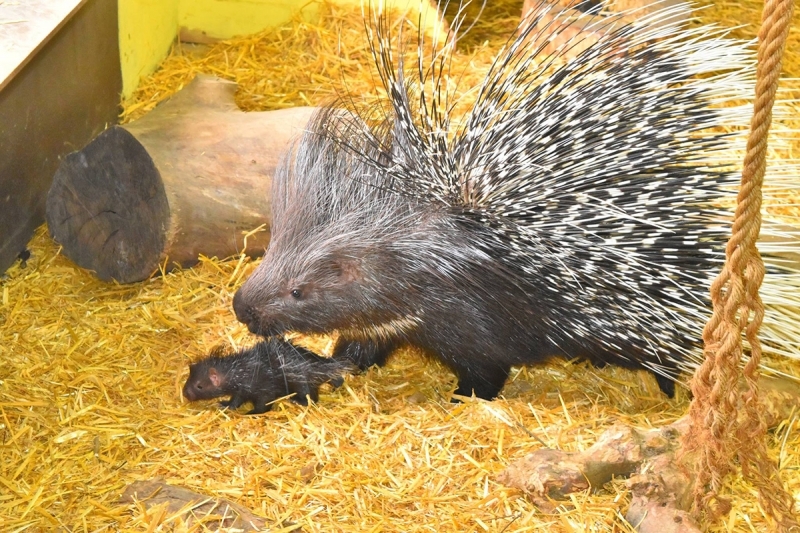 Porcupine update! The first month since the porcupettes were born have a been a rocky one. Being first time parents, the twins (Rick and Morty) proved a handful for Hatari and Kuchimba. After the first few days, the keepers noted that Kuchimba started to reject her young (something that occurs naturally) so, upon veterinary advice, we started to supplementary feed them. Despite round the clock care, Morty sadly passed. With all our efforts now firmly concentrated on little Rick, we’re pleased to announce that he is doing really well, and can now be seen in the African Space with his parents. Please note that all of our animals are afforded the right of privacy, so whilst on show they may sometimes choose to take themselves off. Also, a huge well done to our dedicated keepers, who will ensure little Rick (now 30 days old) thrives.